Apple Computer’s “1984” television commercial aired at 1:00 am on Channel 11, KMVT, in Twin Falls, Idaho. The spot, produced by the Los Angeles, California Chiat/Day advertising agency, would go down in history as one of the most effective and memorable ads in history. In it, a woman running through a bleak "Orwellian" office setting hurls a massive sledgehammer into a monitor from which "Big Brother" is directing his office drones as a narrator announces, “On January 24th, Apple Computer would introduce Macintosh. And you’ll see why 1984 won’t be like 1984.” The advertising campaign for which the ad was a centerpiece wouldn’t officially be launched until the third quarter of Super Bowl XVIII on January 22, 1984, but this spot was run “under the radar” in order to make the company eligible for the following year’s advertising awards. "1984" would later be nominated for “Commercial of the Decade” by the trade magazine Advertising Age. The ISO C (C90) programming language was adopted by the International Organization for Standardization (ISO). The former administrator or "sysop" of the Davy Jones Locker Bulletin Board System (BBS), Richard D. Kenadek, plead guilty to criminal copyright infringement. The fourty-three year-old Massachusetts man distributed a wide range of software to the users of his BBS, each of which had paid a ninety-nine dollar annual subscription fee. Davy Jones Locker had members in thirty-six states and eleven foreign nations. Kenadek would be sentenced to six months of home detention followed by two years of probation in March. 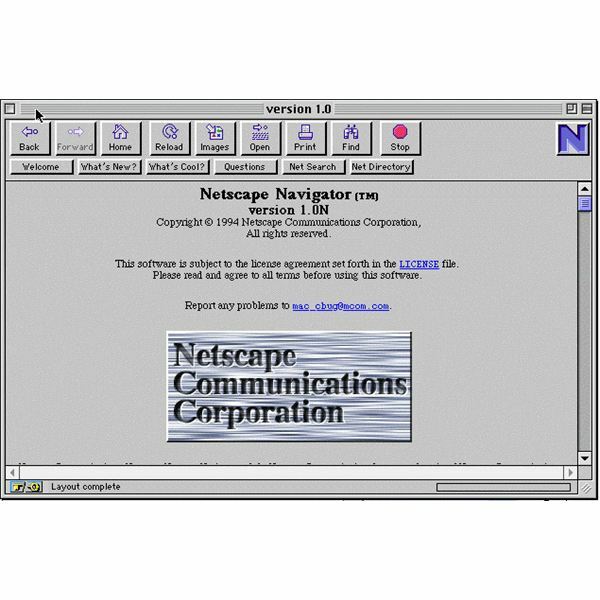 Netscape released the world’s first commercial web browser, version 1.0 of Netscape Navigator. The browser was far more advanced than Mosaic, the first popular graphical web browser, largely due to the fact that Netscape had significantly more resources than the National Center for Supercomputing Applications (NCSA), and as a result, Navigator was an immediately success. The Fortran 95 ISO programming language was was adopted by the International Organization for Standardization (ISO). In Tokyo, Japan, a twenty-four year old woman committed suicide by swallowing cyanide capsules she had ordered from an Internet website that offered them specifically for the purposes of committing suicide. Later in the day, the twenty-seven year old man who had run the site committed suicide by taking the same pills himself after learning of the woman’s death. Yahoo! launched Yahoo Address Book. Microsoft released its Windows 2000 operating systems to computer manufacturers for pre-installations. Computers with the system installed would first be sold to consumers on February 17, 2000. The company marketed Windows 2000 as its most secure operating system yet. The website of the software ecommerce website Egghead.com was hacked, and as a result, the company’s customer database, which contained some 3.7 million credit card numbers, was left exposed to the Internet. Twenty-one year old Brian Salcedo of Michigan received the longest sentence ever handed down to a hacker. Salcedo man was sentenced to nine years in prison after pleading guilty to having accessed the unsecured WiFi network of a Lowe’s hardware store in Detroit, Michigan in an attempt to steal credit card numbers. The sentence was longer even than that of the notorious hacker Kevin Mitnick, and it was the first sentence ever handed down for "wardriving." Even so, the sentence was mitigated for Salcedo’s efforts to later assist Lowe’s in securing its networks. Versions 4.3.10 and 5.0.3 of the PHP programming language were released. The Zafi Merry Christmas worm, also known as Zafi.D, was discovered. The worm, which effected Windows systems, would overwrite existing antivirus applications, install a backdoor, and place the system in the control of remote computers for use in distributed denial of service attacks. Mathematicians Dr. Curtis Cooper and Dr. Steven Boone of the University of Central Missouri discover the forty-third and largest known Mersenne prime number using a seven hundred computer cluster in participation with the Great Internet Mersenne Prime Search (GIMPS) distributed computing project. The number is 9,152,052 digits long, and it was the ninth Mersenne prime number discover by GIMPS.